The roots of Witchcraft go back to the very first civilizations humans ever created. It is very difficult to track down the complete history of the Craft (as Witchcraft is also referred to), as its ways are not easily distinguished from religions or other practices. However, it seems that through the millennia, some things resisted the decay of time. Regardless of barbaric prosecutions, they remained the same and common to all traditions. For example, the Witching hour! Witchcraft was outlawed in Europe for most of the time after Christianity was established as the dominant religion of Europe. However, it has never left our world for many reasons. First of all, many believe that the Witches of the middle ages were, in fact, pissed of priests and priestesses of the old religions who dared to defy the “rules of Christianity”. They did what they had to do, to keep the magic cauldron warm. Although Jesus Christ preached love and tolerance, witches or so-called ‘witches’ suffered the violence of the Witch-frenzy. Even now, Witch Hunts are pretty popular in some places of the World. (See here about modern Witch Hunts). Thankfully, now, Witchcraft is officially tolerated in Europe. Witches have even branded a new Religion – Wicca – although only a part of Witches defines themselves as Wiccans. The practice of Magic can now go back to normal. When is the “Witching Hour”? It has been attempted to give definitions for the Witching Hour, but most of them sound unconvincing, as different rules apply in different traditions and locations. We will try to sum up what is going on. 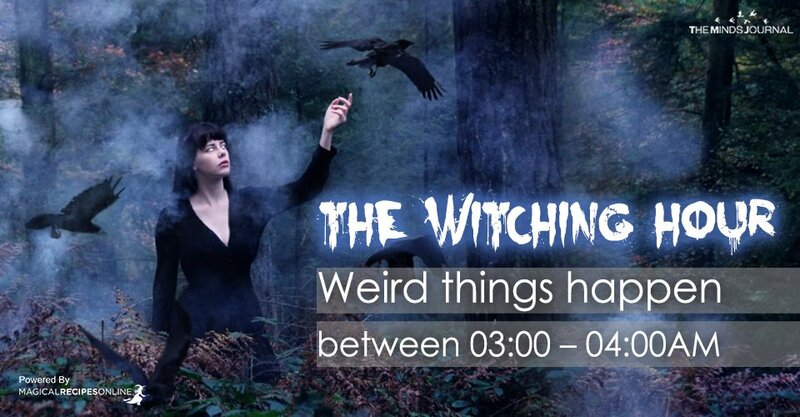 The most famous version of the ‘Witching hour’ is the hour between 03:00 AM and 04:00 AM. It is also known as the Holy hour, or -interestingly- the Devil’s hour, too. Some other versions put the ‘Witching hour’ at 2:16 AM, 3 AM, 3:15 AM or 3:33 AM, the suggestion being that this is an inversion of the time at which Christ died at Calvary. A mockery of Jesus death, who is believed to have died at 03:00 PM. As we read the article of all Esbats – Phases of the Moon: “The ‘Witching Hour’ usually refers to the Midnight hour during a Full Moon. It was always regarded as a particularly potent time for Magic, as the Moon is not Waxing nor Waning and midnight are considered the time between the Days- in between time in between worlds. During the Full Moon time all magic work is empowered, all magical work is fertile.” Keep also in mind that in a Full Moon’s night, the Moon is in it’s highest positions during real midnight (without considering DST). Another theory – which is applied in Australia, the ‘be-Witching hour’ is around midnight. According to a Japanese tradition, the Witching hour is at the moment of, and a little before and after of, the sunset. According to this tradition, at that moment the veil between the worlds, just for a few moments, vanishes, and supernatural phenomena happen on their own too. What happens during the “Witching Hour”? Witches, conjurers, and sorcerers are more magically capable to cast their spells. Why? Probably because it’s the time when they have more privacy to cast the spell exactly the way they want it. During this hour, ‘the veil’ between Spirits and humans is lifted. This makes things easier for the spirits to travel our world and meet up with the humans of their choice. It’s the time when most “visits” occur. Ghosts and Vampires go out to “play”. Their victims seem to be in the most vulnerable place. Haunted places become more so. Demons “love” to attack during this hour. Many demonic possessions reportedly happen during this hour. Movie industry adopted the idea of Witching Hour (3 AM) into their scenes to add to the background of the thrill and horror. For example in ‘the Conjuring’, the clocks stop at 3:07 AM. From this time things get pretty messed up and take a seriously bad turn. Why All these things happen during the ‘Witching Hour’? Our body has an installed – fully functioning – biological clock, also known as the ‘Circadian Circle‘. It’s attuned to the light of the day. This “clock” is what goes wrong when we travel long distance. Have you heard of the “jet lag” syndrome? That’s what it’s all about. During the ‘Witching Hour,’ the body reaches it’s the lowest temperature. We experience the deepest levels of sleep. All our biological functions seem also to be asleep. Hospitals and nursing units report most deaths during 3 to 4 in the morning. According to a study by Harvard Medical School, the chances of death increase during this hour. This is the time when we are more “sensitive” to external psychic stimuli. Mediums and psychics find it easier to “talk” and communicate with spirits during this time. This is when we “sense” the spirits more. During the witching hour, we can project a telepathic message in a more successful way. Many experiments indicate the same hour as the most successful. A large percentage of Sleeping Paralysis occur during this time. During the dark ages, superstitious people believed that the witches and the demons were actually responsible for the sleeping paralysis along with their misfortunes. Puritans believed that witches carried out their dark rituals during that time, when everybody was asleep, only to avoid getting caught. Do you Wake up during the ‘Witching Hour’?